A variety within a dialect continuum may be developed and codified as a standard language, and then serve as an authority for part of the continuum, e.g. within a particular political unit or geographical area. Since the early 20th century, the increasing dominance of nation-states and their standard languages has been steadily eliminating the nonstandard dialects that comprise dialect continua, making the boundaries ever more abrupt and well-defined. Standard varieties may be developed and codified at one or more locations in a continuum, a process known as ausbau, until they have independent cultural status, or autonomy. Speakers of local varieties typically read and write a related standard variety, use it for official purposes, hear it on radio and television, and consider it the standard form of their speech, so that any standardizing changes in their speech are towards that variety. In such cases the local variety is said to be dependent on, or heteronomous with respect to, the standard variety. The choice of standard is often determined by a political boundary, which may cut across a dialect continuum. As a result, speakers on either side of the boundary may use almost identical varieties, but treat them as dependent on different standards, and thus part of different "languages". The various local dialects then tend to be leveled towards their respective standard varieties, disrupting the previous dialect continuum. Examples include the boundaries between Dutch and German, between Czech, Slovak and Polish, and between Belarusian and Ukrainian. The choice may be a matter of national, regional or religious identity, and may be controversial. Examples of controversies are regions such as the disputed territory of Kashmir, in which local Muslims usually regard their language as Urdu, the national standard of Pakistan, while Hindus regard the same speech as Hindi, an official standard of India. In the Yugoslav republic of Macedonia, a standard was developed from local varieties within a continuum with Serbia to the north and Bulgaria to the east. The standard was deliberately based on varieties from the west of the republic that were most different from standard Bulgarian. Now known as Macedonian, it is the national standard of North Macedonia, but viewed by Bulgarians as a dialect of Bulgarian. The German linguist Heinz Kloss developed the abstand and ausbau language framework, which helps to analyze the relationships between standard and non-standard linguistic varieties. Major dialect continua in Europe in the mid-20th century. [a] North Slavic corresponds to the area that is described here as East Slavic and West Slavic. Europe provides several examples of dialect continua, the largest of which involve the Germanic, Romance and Slavic branches of the Indo-European language family, the continent's largest language groups. The Romance area spanned much of the territory of the Roman Empire, but was split into western and eastern portions by the Slav Migrations into the Balkans in the 7th and 8th centuries. The Slavic area was in turn split by the Hungarian conquest of the Carpathian Basin in the 9th and 10th centuries. The Germanic languages and dialects of Scandinavia are a classic example of a dialect continuum, from Swedish dialects in Finland, to Swedish, Gutnish, Elfdalian, Scanian, Danish, Norwegian (Bokmål and Nynorsk), Faroese, Icelandic, with many local dialects of those languages. The Continental North Germanic languages (Swedish, Danish, and Norwegian) are close enough and intelligible enough for some to consider them to be dialects of the same language, but the Insular ones (Icelandic and Faroese) are not immediately intelligible to the other North Germanic speakers. Historically, the Dutch, Frisian and German dialects formed a perfect dialect continuum, which has been gradually falling apart since the Late Middle Ages due to the pressures of modern education, standard languages, migration and weakening knowledge of the dialects. From Central German to Southeastern Dutch (Limburgish) in the so-called Rhenish fan, an area corresponding largely to the modern Niederrhein in which gradual but geographically compact changes took place. From Low Saxon[b] to Northwestern Dutch (Hollandic). This sub-continuum also included West Frisian dialects up until the 1600s, but faced external pressure from Standard Dutch and, after the collapse of the Hanseatic League, Standard German which greatly influenced the vocabularies of these border dialects. Though the internal dialect continua of both Dutch and German remain largely intact, the continuum which historically connected the Dutch, Frisian and German languages has largely disintegrated. Fragmentary areas of the Dutch-German border in which language change is more gradual than in other sections or a higher degree of mutual intelligibility is present still exist, such as the Aachen-Kerkrade area, but the historical chain in which dialects were only divided by minor isoglosses and negligible differences in vocabulary has seen a rapid and ever-increasing decline since the 1850s. Standard Dutch (based on the dialects of the principal Brabantic and Hollandic cities) and Standard German (originating at the chanceries of Meissen and Vienna) are not closely linked with regard to their ancestral dialects and hence do not show a high degree of mutual intelligibility when spoken and only partially so when written. One study concluded that when concerning written language, Dutch speakers could translate 50.2% of the provided German words correctly, while the German subjects were able to translate 41.9% of the Dutch equivalents correctly. In terms of orthography, 22% the vocabulary of Dutch and German is identical or near identical. The Germanic dialects spoken on the island of Great Britain, which are usually called "English" in England and "Scots" in Scotland, are often mutually intelligible in areas along the border. The Orcadian dialect of Scots is very different from the various dialects of English in southern England, but they are linked by a chain of intermediate steps. The western continuum of Romance languages comprises, from West to East: in Portugal, Portuguese; in Spain, Galician, Leonese or Asturian, Castilian or Spanish, Aragonese and Catalan or Valencian; in France, Occitan, Franco-Provençal, standard French and Corsican which is closely related to Italian; in Italy, Piedmontese, Italian, Lombard, Venetian, Friulian, Ladin; and in Switzerland, Lombard and Romansh. This continuum is sometimes presented as another example, but the major languages in the group have had separate standards for longer than the languages in the Continental West Germanic group, and so are not commonly classified as dialects of a common language. Focusing instead on the local Romance lects that pre-existed the establishment of national or regional standard languages, all evidence and principles point to Romania continua as having been, and to varying extents in some areas still being, what Charles Hockett called an L-complex, i.e. an unbroken chain of local differentiation such that, in principle and with appropriate caveats, intelligibility (due to sharing of features) attenuates with distance. This is perhaps most evident today in Italy, where, especially in rural and small-town contexts, local Romance is still often employed at home and work, and geolinguistic distinctions are such that while native speakers from any two nearby towns can understand each other with ease, they can also spot from linguistic features that the other is from elsewhere. The Romance languages of Italy are a less arguable example of a dialect continuum. For many decades since Italy's unification, the attitude of the French government towards the ethnolinguistic minorities was copied by the Italian government. The eastern Romance continuum is dominated by Romanian in many respects. Romanian is spoken throughout Romania and its dialects meet the Moldovan registers spoken across the border in Moldova. Romanians believe the Moldovan language to be a dialect (grai) of Romanian, but some separatist political forces in the Republic of Moldova claim that Moldovan is a separate language. Outside Romania, across the other south-east European countries, various Romanian language groups are to be found: pockets of various Romanian and Aromanian subgroups survive throughout Serbia, North Macedonia, Greece, Albania and Croatia (in Istria). East Slavic consists of the Russian, Belarusian, Rusyn and Ukrainian languages. The Rusyn and western Belarusian dialects have in turn been influenced by neighboring West Slavic languages such as Slovak and Polish (due to the historical ties with the Polish–Lithuanian Commonwealth). All South Slavic languages form a dialect continuum. It comprises, from West to East, Slovenia, Croatia, Bosnia and Herzegovina, Montenegro, Serbia, North Macedonia, and Bulgaria. Standard Slovene, Macedonian, and Bulgarian are each based on a distinct dialect, but the Bosnian, Croatian, Montenegrin, and Serbian standard varieties of the pluricentric Serbo-Croatian language are all based on the same dialect, Shtokavian. Therefore, Croats, Serbs, Bosniaks and Montenegrins communicate fluently with each other in their respective standardized varieties. On the other hand, Croats speaking one dialect (Kajkavian) can hardly communicate with Croats who speak a different dialect (Chakavian). The same is true for Serbian Shtokavian and Torlakian dialects. The latter is closer to the Eastern South Slavic languages (Bulgarian and Macedonian) than to Western South Slavic. They share a set of grammatical features that set them apart from all other Slavic languages. The barrier between East South Slavic and West South Slavic is historical and natural, caused primarily by geographical distance between speakers. The two varieties started diverging early on (circa 11th century CE) and evolved separately ever since without major mutual influence, as evidenced by distinguishable Old Bulgarian, while western dialect of common Old Slavic was still spoken in modern Serbo-Croatian area in 12th and early 13th century. An intermediate dialect linking western and eastern variations thus came into existence, to facilitate communication, over time – Torlakian – spoken on the fringes of Bulgaria, North Macedonia (northern) and Serbia (eastern). The West Slavic languages consist of Czech, Polish, Slovak, Silesian, Kashubian, and Sorbian (Upper Sorbian and Lower Sorbian). Western Slavic is usually divided into three subgroups, Czecho-Slovak (Czech and Slovak), Lechitic (Polish, Silesian, and Kashubian) and Sorbian (Upper and Lower). All West Slavic languages share a high degree of mutual intelligibility towards each other, the most prominent and well-known being between Czech and Slovak. The other major language family in Europe besides Indo-European are the Uralic languages. The Sami languages, sometimes mistaken for a single language, are a dialect continuum, albeit with some disconnections like between North, Skolt and Inari Sami. The Baltic-Finnic languages spoken around the Gulf of Finland form a dialect continuum. Thus, although Finnish and Estonian are separate languages, there is no definite linguistic border or isogloss that separates them. Recognition of this fact is however more difficult today because many of the intervening languages have declined or gone extinct. Turkic languages are best described as a dialect continuum. Geographically this continuum starts at the Balkans in the west with Balkan Turkish, includes Turkish in Turkey and Azerbaijani language in Azerbaijan, extends into Iran with Azeri and Khalaj, into Iraq with Turkmen, across Central Asia to include Turkmenistan, Uzbekistan, Kazakhstan, Kyrgyzstan, to southern Regions of Tajikistan and into Afghanistan. In the south, the continuum starts in northern Afghanistan, northward to the Chuvashia. In the east it extends to the Republic of Tuva, the Xinjiang autonomous region in Western China with the Uyghur language and into Mongolia with Khoton. The entire territory is inhabited by Turkic speaking peoples. There are three varieties of Turkic geographically outside the continuum: Chuvash, Yakut and Dolgan. They have been geographically separated from the other Turkic languages for an extensive period of time, and Chuvash language stands out as the most divergent from other Turkic languages. Arabic is a standard case of diglossia. The standard written language, Modern Standard Arabic, is based on the Classical Arabic of the Qur'an, while the modern vernacular dialects (or languages) branched from Classical Arabic a few hundred years earlier, from North Western Africa through Egypt, Sudan, and the Fertile Crescent to the Arabian Peninsula and Iraq. The dialects use different analogues from the huge Arabic language inventory, use different shortcuts[according to whom?] and have been influenced by different substrate and superstrate languages. Adjacent dialects are mutually understandable to a large extent, but those from distant regions are not at all. In Hakkari, as one goes eastbound towards Iran, the Gawar, Baz, Jilu and Nochiya dialects would respectively begin to sound slightly distinct to the Tyari/Barwar dialects in the west and more like the prestigious "Urmian" dialect in Urmia, Western Azerbaijan, which is considered the Standard Assyrian dialect, alongside the Iraqi Koine. The dialects in Northern Iraq (or "far west" in this continuum), such as those of Alqosh and Batnaya, would not be completely intelligible to those in Western Iran ("far east") even if the same language is spoken. Going further westward, the "dialect" of Tur Abdin in Turkey, known as Turoyo, has a very distinct pronunciation of words and a different vocabulary to some extent. Turoyo is usually considered to be a discrete language rather than a mere dialect of Assyrian Neo-Aramaic. Finally, both Assyrian and Turoyo are considered to be dialects of the Syriac language. The Persian language in its various varieties (Farsi in Iran, Dari in Afghanistan and Tajik in Tajikistan and other parts of the former Soviet Union, is representative of a dialect continuum. The divergence of Tajik was accelerated by the shift from the Perso-Arabic alphabet to a Cyrillic one under the Soviets. Western dialects of Persian show greater influence from Arabic and Oghuz Turkic languages, but Dari and Tajik tend to preserve many classical features in grammar and vocabulary. Many of the Indo-Aryan languages of Northern India (including Assam Valley as for the language Assamese) and Pakistan form a dialect continuum. What is called "Hindi" in India is frequently Standard Hindi, the Sanskritized register of the colloquial Hindustani spoken in the Delhi area since the Mughals, the other register being Urdu. However, the term Hindi is also used for the different dialects from Bihar to Rajasthan and, more widely, some of the Eastern and Northern dialects are called Hindo. The Indo-Aryan Prakrits also gave rise to languages like Gujarati, Assamese, Maithili, Bengali, Odia, Nepali, Marathi, Konkani and Punjabi. ^ Carpathian Ruthenia is mistakenly excluded from North Slavic on the map, even though Rusyn, an East Slavic dialect group on the transition to West Slavic, is spoken there. ^ Bloomfield, Leonard (1935). Language. London: George Allen & Unwin. p. 51. ^ Hockett, Charles F. (1958). A Course in Modern Linguistics. New York: Macmillan. pp. 324–325. ^ Cruse, D.A. (1986). Lexical Semantics. Cambridge: Cambridge University Press. p. 71. ISBN 978-0-521-27643-6. ^ Chambers, J.K.; Trudgill, Peter (1998). Dialectology (2nd ed.). Cambridge University Press. pp. 13–19, 89–91. ISBN 978-0-521-59646-6. ^ Chambers & Trudgill (1998), pp. 15–17. ^ a b Chambers & Trudgill (1998), p. 25. ^ Chambers & Trudgill (1998), p. 27. ^ Chambers & Trudgill (1998), pp. 93–94. ^ Chambers & Trudgill (1998), pp. 94–95. ^ Chambers & Trudgill (1998), pp. 91–93. ^ Chambers & Trudgill (1998), p. 10. ^ Chambers & Trudgill (1998), pp. 9–12. ^ Stewart, William A. (1968). "A sociolinguistic typology for describing national multilingualism". In Fishman, Joshua A. (ed.). Readings in the Sociology of Language. De Gruyter. pp. 531–545. doi:10.1515/9783110805376.531. ISBN 978-3-11-080537-6. ^ Chambers & Trudgill (1998), p. 11. ^ Chambers & Trudgill (1998), pp. 3–4. ^ Chambers & Trudgill (1998), p. 4. ^ Chambers & Trudgill (1998), p. 9. ^ Woolhiser, Curt (2011). "Border effects in European dialect continua: dialect divergence and convergence". In Kortmann, Bernd; van der Auwera, Johan (eds.). The Languages and Linguistics of Europe: A Comprehensive Guide. Walter de Gruyter. pp. 501–523. ISBN 978-3-11-022025-4. p. 501. ^ Woolhiser (2011), pp. 507, 516–517. ^ Trudgill, Peter (1997). "Norwegian as a Normal Language". In Røyneland, Unn (ed.). Language Contact and Language Conflict. Volda College. pp. 151–158. ISBN 978-82-7661-078-9. p. 152. ^ Trudgill, Peter (1992). "Ausbau sociolinguistics and the perception of language status in contemporary Europe". International Journal of Applied Linguistics. 2 (2): 167–177. doi:10.1111/j.1473-4192.1992.tb00031.x. pp. 173–174. ^ Chambers & Trudgill (1998), p. 6. ^ a b c Niebaum, Herman (2008). "Het Oostnederlandse taallandschap tot het begin van de 19de eeuw". In Van der Kooij, Jurgen (ed.). Handboek Nedersaksische taal- en letterkunde. Van Gorcum. pp. 52–64. ISBN 978-90-232-4329-8. p. 54. ^ Chambers & Trudgill (1998), p. 92. ^ Gooskens, et al. (2009). Cross-border intelligibility: On the intelligibility of Low German among speakers of Danish and Dutch"
^ ERICarts, Council of Europe. "Italy : 5.1 General legislation : 5.1.9 Language laws". www.culturalpolicies.net. ^ "Italiano e dialetto oggi in Italia – Treccani, il portale del sapere". www.treccani.it. ^ Crystal, David (1998) [1st pub. 1987]. The Cambridge encyclopedia of language. Cambridge, New York: Cambridge University Press. p. 25. OCLC 300458429. ^ Kristophson, Jürgen (2000). "Vom Widersinn der Dialektologie: Gedanken zum Štokavischen" [Nonsense of Dialectology: Thoughts on Shtokavian]. Zeitschrift für Balkanologie (in German). 36 (2): 180. ISSN 0044-2356. ^ Kordić, Snježana (2004). "Pro und kontra: "Serbokroatisch" heute" [Pro and contra: "Serbo-Croatian" nowadays] (PDF). In Krause, Marion; Sappok, Christian (eds.). Slavistische Linguistik 2002: Referate des XXVIII. Konstanzer Slavistischen Arbeitstreffens, Bochum 10.-12. September 2002. Slavistishe Beiträge ; vol. 434 (in German). Munich: Otto Sagner. pp. 97–148. ISBN 978-3-87690-885-4. OCLC 56198470. Archived from the original (PDF) on |archive-url= requires |archive-date= (help). ^ Blum, Daniel (2002). Sprache und Politik : Sprachpolitik und Sprachnationalismus in der Republik Indien und dem sozialistischen Jugoslawien (1945–1991) [Language and Policy: Language Policy and Linguistic Nationalism in the Republic of India and the Socialist Yugoslavia (1945–1991)]. Beiträge zur Südasienforschung ; vol. 192 (in German). Würzburg: Ergon. p. 200. ISBN 978-3-89913-253-3. OCLC 51961066. ^ Gröschel, Bernhard (2009). Das Serbokroatische zwischen Linguistik und Politik: mit einer Bibliographie zum postjugoslavischen Sprachenstreit [Serbo-Croatian Between Linguistics and Politics: With a Bibliography of the Post-Yugoslav Language Dispute]. Lincom Studies in Slavic Linguistics ; vol 34 (in German). Munich: Lincom Europa. pp. 82–83. ISBN 978-3-929075-79-3. LCCN 2009473660. OCLC 428012015. OL 15295665W. ^ Kordić, Snježana (2010). Jezik i nacionalizam [Language and Nationalism] (PDF). Rotulus Universitas (in Serbo-Croatian). Zagreb: Durieux. pp. 74–77. ISBN 978-953-188-311-5. LCCN 2011520778. OCLC 729837512. OL 15270636W. Archived (PDF) from the original on 8 July 2012. Retrieved 15 May 2014. ^ Pohl, Hans-Dieter (1996). "Serbokroatisch – Rückblick und Ausblick" [Serbo-Croatian – Looking backward and forward]. In Ohnheiser, Ingeborg (ed.). Wechselbeziehungen zwischen slawischen Sprachen, Literaturen und Kulturen in Vergangenheit und Gegenwart : Akten der Tagung aus Anlaß des 25jährigen Bestehens des Instituts für Slawistik an der Universität Innsbruck, Innsbruck, 25–27 Mai 1995. Innsbrucker Beiträge zur Kulturwissenschaft, Slavica aenipontana ; vol. 4 (in German). Innsbruck: Non Lieu. pp. 205–219. OCLC 243829127. ^ Škiljan, Dubravko (2002). Govor nacije: jezik, nacija, Hrvati [Voice of the Nation: Language, Nation, Croats]. Biblioteka Obrisi moderne (in Serbo-Croatian). Zagreb: Golden marketing. p. 12. OCLC 55754615. ^ Thomas, Paul-Louis (2003). "Le serbo-croate (bosniaque, croate, monténégrin, serbe): de l'étude d'une langue à l'identité des langues" [Serbo-Croatian (Bosnian, Croatian, Montenegrin, Serbian): from the study of a language to the identity of languages]. Revue des études Slaves (in French). 74 (2–3): 315. ISSN 0080-2557. ^ Grenoble, Lenore A. (2003). Language Policy in the Soviet Union. Language Policy. 3. Springer-Verlag. ISBN 978-1-4020-1298-3. ^ Adolf Wahrmund (1898). Praktisches Handbuch der neu-arabischen Sprache ... Volumes 1-2 of Praktisches Handbuch der neu-arabischen Sprache (3 ed.). J. Ricker. Retrieved 6 July 2011. ^ Kaye, Alan S.; Rosenhouse, Judith (1997). "Arabic Dialects and Maltese". In Hetzron, Robert (ed.). The Semitic Languages. Routledge. pp. 263–311. ISBN 978-0-415-05767-7. ^ Rev. Justin Perkins, A residence of eight years in Persia among the Nestorian Christians, New York, 1843. p. 304. ^ a b Norman, Jerry (2003). "The Chinese dialects: phonology". In Thurgood, Graham; LaPolla, Randy J. (eds.). 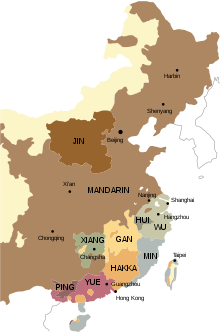 The Sino-Tibetan languages. Routledge. pp. 72–83. ISBN 978-0-7007-1129-1. p. 72. ^ Hamed, Mahé Ben (2005). "Neighbour-nets portray the Chinese dialect continuum and the linguistic legacy of China's demic history". Proceedings of the Royal Society B: Biological Sciences. 272 (1567): 1015–1022. doi:10.1098/rspb.2004.3015. JSTOR 30047639. PMC 1599877. PMID 16024359. ^ Kurpaska, Maria (2010). Chinese Language(s): A Look Through the Prism of "The Great Dictionary of Modern Chinese Dialects". Walter de Gruyter. pp. 41–55. ISBN 978-3-11-021914-2. ^ Sagart, Laurent (1998). "On distinguishing Hakka and non-Hakka dialects". Journal of Chinese Linguistics. 26 (2): 281–302. JSTOR 23756757. p 299. ^ Halliday, M.A.K (1968) . "The users and uses of language". In Fishman, Joshua A. (ed.). Readings in the Sociology of Language. Walter de Gruyter. pp. 139–169. ISBN 978-3-11-080537-6. p. 12. ^ Yan, Margaret Mian (2006). Introduction to Chinese Dialectology. LINCOM Europa. pp. 223–224. ISBN 978-3-89586-629-6. ^ de Sousa, Hilário (2016). "Language contact in Nanning: Nanning Pinghua and Nanning Cantonese". In Chappell, Hilary M. (ed.). Diversity in Sinitic Languages. Oxford University Press. pp. 157–189. ISBN 978-0-19-872379-0. p. 162. ^ Halliday (1968), pp. 11–12. ^ "LINGUIST List 6.744: Cree dialects". www.linguistlist.org. 29 May 1995. ^ "Cree Language and the Cree Indian Tribe (Iyiniwok, Eenou, Eeyou, Iynu, Kenistenoag)". www.native-languages.org. This page was last edited on 20 April 2019, at 06:56 (UTC).